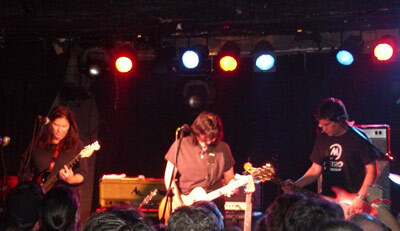 I just pulled in from midtown Atlanta, The Loft, specifically, where The Breeders just put on a hell of a show. I’ve been a big Breeders fan since the Last Splash days (14 years ago). Yet due to the band’s somewhat sporadic history, tonight was my first opportunity to see them play live. And what a great performance they put on. The band was in good form and in good spirits, clearly having a good time. This was the last show of the tour (or as Kim Deal said at one point “the last tour of the show”). Maybe it was just road exhaustion, but the band was positively loopy. Or maybe everyone was just in a good mood. Jokes were told, funny faces were made and anecdotes were shared. At one point, Kim introduced the band’s third guitar player Cheryl, mentioning that she was from Florida and asking who else in the audience was from there as well. In response to a number of “whooops” that erupted from the crowd, Kim said “We’re from Dayton Ohio, so we got you there” and merriment ensued. The show itself covered the gamut of Deal-related material, including songs from The Amps side project. In fact, the show opened with Tipp City, which happens to be one of my favorite Amps songs. Last Splash got some good treatment, with renditions of New Year, No Aloha, I Just Wanna Get Along, Divine Hammer, a sublime version of Drivin on 9 and of course Cannonball. A house-collapsing performance of Saints closed the first encore. The Breeders latest album, Mountain Battles, was also well represented. Bang On, We’re Gonna Rise, Here No More, Night of Joy, German Studies, Walk it Off and No Way all made appearances. Noticeably absent though was much of the material from Title TK. Huffer was brilliant, but other than that I don’t remember the band playing any other song from that album. Similar story with the songs from The Breeders’ debut album, Pod. Only a handful from there as well: Iris, Happiness is a Warm Gun (Beatles cover) and one of my most favoritest songs ever Fortunately Gone, which closed out the second encore, the show and the tour. A perfecting end note for a wonderful experience. Given just how great a band The Breeders are, the sporadicness of its output can be quite frustrating. But going to bed now on a natural musical buzz, I can say that after seeing the band perform live, I have accomplished a life goal that’s been with me for nearly one and half decades. Seeing Ratatat perform live is one of my favorite things in the world. This show marks the third time I’ve managed to catch a performance and each time has been simply mind-blowing. In studio, Ratatat’s synthesized beats are phenomenally addictive and their guitar melodies rock oh so much. But live, man, there’s this power and richness of atmosphere that creates a unique kind of sonic ambrosia that’s rare in modern popular music. If I had the means, I would totally follow them around on tour. For a good explanation of the Ratatat sound (and better photos of the show), check ohmpark’s write-up. 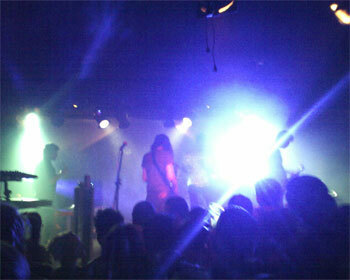 Though I hesitate to lump Ratatat in with the 8-bit sound crowd. In fact, I think the band could hardly be farther from it. 8-bit operators rely on the primitiveness of early game music as the source and inspiration for their sound, whereas Ratatat is clearly coming from a traditional rock background (whaling guitars!) spiced with a danceable groove and almost baroque composition style. Ratatat will play a few more date in the U.S. and U.K. throughout April. Go see them if you can. For a taste of the Ratatat live experience, check out this crappy cameraphone video clip I shot during Lex, one of the rockin’ist songs in the repertoire. Thus, all the shows are listed chronologically. As far as iTunes is concerned, each show is just an album that starts with a number. Today found me listening to a 1995 Soul Coughing show in New York City, a completely rockin’ Toronto 2004 performance by Mouse on Mars who I’ve managed to see, twice. If you get the chance, go! and a 2001 show by Air [french band] in Los Angeles. Also sandwiched in there was A Data Learn the Language, an uber-smooth postrock record by The Mercury Program. Good stuff that.